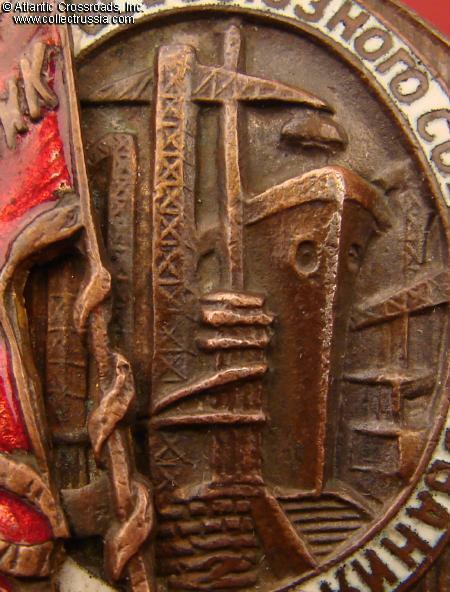 Badge for Excellence in All-Union Socialist Competition, Narkomat of Shipbuilding, Type 1, #341, circa 1942-43. 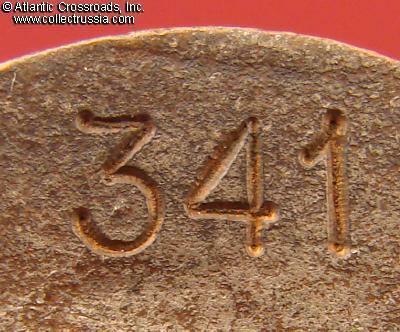 Brass, enamels; 38.0 x 27.1 mm; massive 3-piece construction. 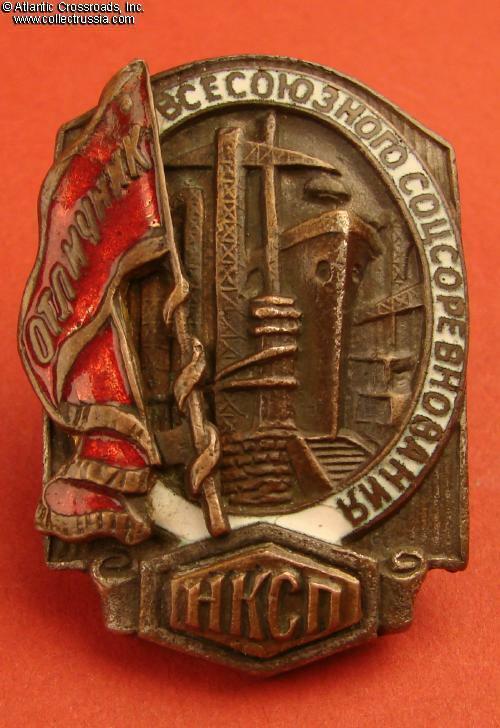 The earliest type of the badge, featuring separate plaque with abbreviation "NKSP" (Narkomat of Shipbuilding) and the wire attachment of the banner. 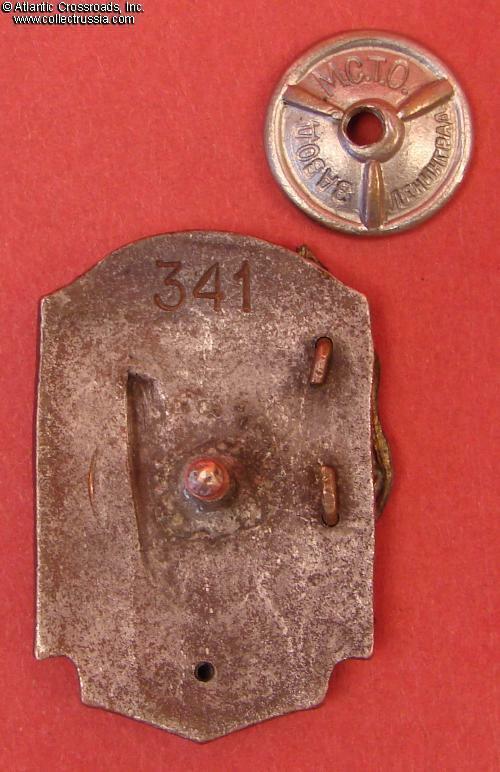 Note the extremely low serial number "341" engraved in "print-like" font and a characteristic feature found only on the earliest of the Shipbuilding Narkomat badges: attachment of the screw post without a screw post base. 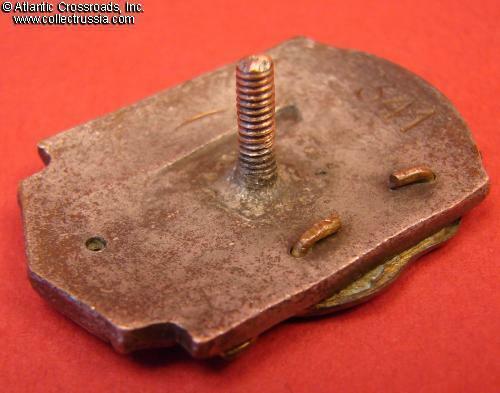 Shows rugged wartime quality but details are nevertheless very nicely executed. In good overall condition. The enamel in the upper corner of the flag is missing and partly repaired; the rest of the red enamel is intact; the white enamel in the band shows only minor pitting, no wear or chips. 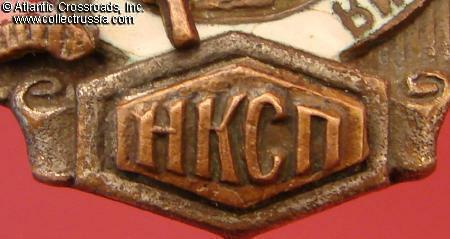 Silver finish is visible in the recessed areas of the obverse and is very well preserved the obverse of the badge. The finial of the flagpole is missing. The raised details are extremely well defined with just the minimal amount of wear to the highest points of the ship's bow. 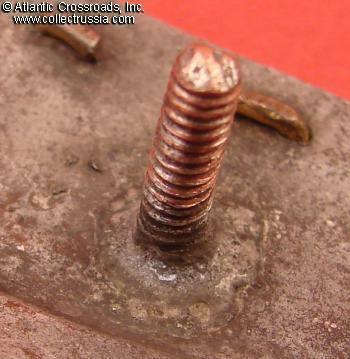 The copper screw post is full length (over 11 mm) and includes period screw plate marked "MSTO Factory, Leningrad" which is probably original to the badge. Very impressive badge, one of the very few awarded in wartime issues and a desirable find despite the condition.